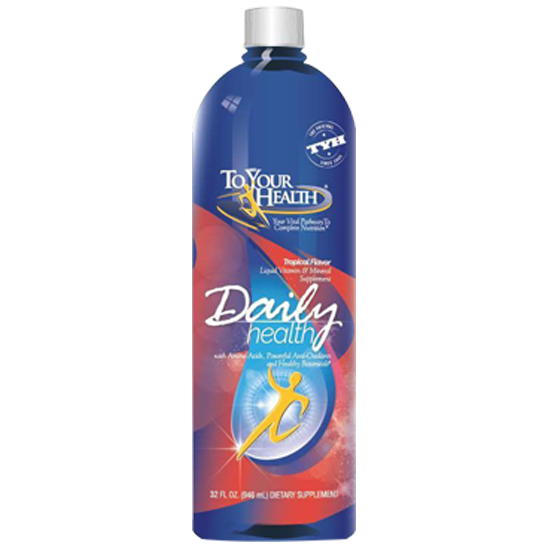 The To Your Health Liquid Vitamin Mineral Supplement includes powerful anti-oxidants and healthy botanicals with a delicious tropical taste. The ingredients may help raise serotonin levels in the brain, which helps control appetite, relieves insomnia, improves mood, and calms anxiety. It is packed with powerful antioxidants, which may slow the aging process and repair cellular damage. To Your Health’s Daily Health may also help overcome fatigue by increasing production of red blood cells. As a dietary supplement, take 2-4 tablespoons (1-2 oz.) daily. Enjoy alone or with water, milk, juice or your favorite beverage.